In St Mary's Church, Church Road, Cowes, Isle of Wight, PO31 8HA. St Mary's Church is Listed Grade II*. Since the Memorial forms part of the fabric of the building it is assumed that it is covered by the Listing. A painted wooden board. 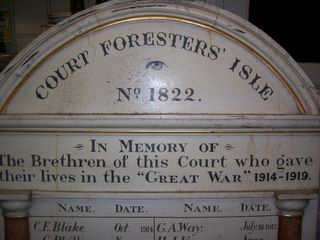 Originally installed in the premises of the Ancient Order of Foresters in Sun Hill, Cowes (Court Foresters' Isle No 1822). History not known until it was "rediscovered" in 2008 in a boat shed used by Sea Cadets of TS Osborne. The Names given in a report in the Isle of Wight County Press 24th April 1920 vary slightly from those recorded on the panel itself. The Memorial plaque was restored in 2008/9 by Wootton Historic Crafts and Restoration, with financial support from Cowes Town Council. The Memorial plaque is to be installed at St Mary's Church in 2009 with a rededication ceremony planned for Remembrance Sunday, 8 November 2009. 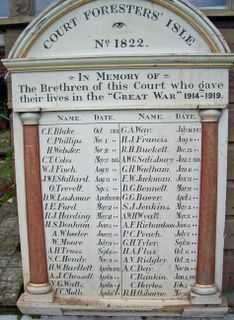 Thanks to David Jones for information and photographs of the Memorial in its state before restoration (2008). their lives in the "GREAT WAR" 1914-1919. Hyperlinks lead to CWGC records.